The Eastern Redbud, cercis canadensis, is among the first trees to bloom here. Blooming occurs in March-April when the buds turn into pink, white, or pink-purple legume-shaped flowers in clusters, depending on the variety, for up to three weeks. This tree is a breath of fresh air after a long and cold winter. The flowers are followed by bean-like seed pods several inches long, which drop from the tree when fully developed. Redbud, a native deciduous tree, is found in USDA Hardiness Zones 4-9, from New England and the middle Atlantic states, south to Georgia, and to Illinois and Wisconsin in the Middle West. Ewing is in zone 6b. The Redbud leaf, from three to five inches long, is heart-shaped and alternately arranged on a zig-zag branching habit, and is reddish-purple when new. By summer the leaves turn shiny green, but gradually change to yellow in the fall. One variety, ‘Forest Pansy’, has purple leaves. There are, among more than 20 varieties of Eastern Redbud, some with variegated, green and white leaves. 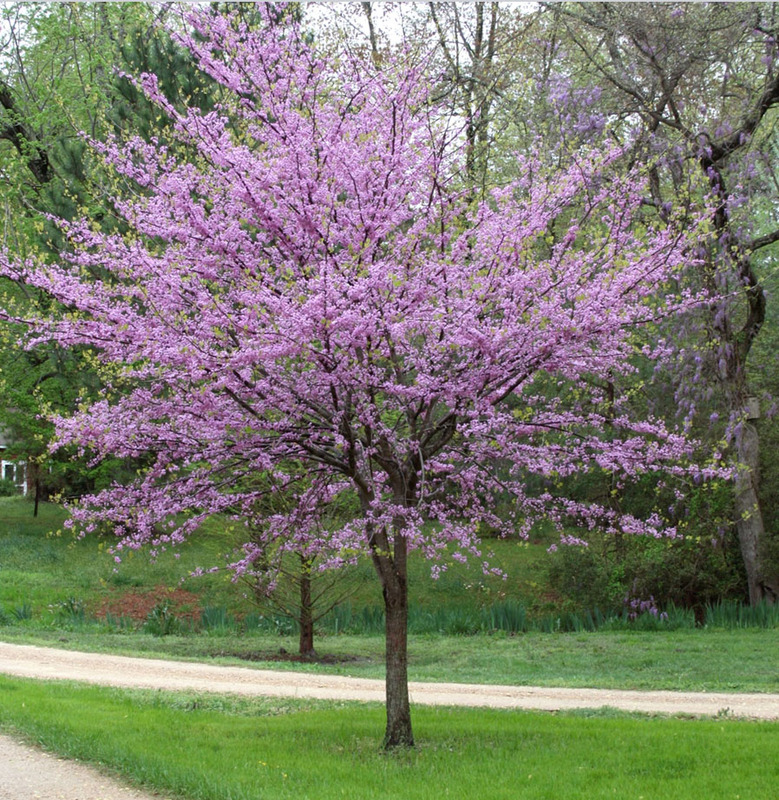 The Eastern Redbud typically ranges from a mature height of 8’ to 20’, depending on the variety, with a spread of 6’-35’. Some varieties have a weeping habit and this usually small-sized tree normally has multiple trunks. A specimen in Morris County has been documented as having a trunk 8’-2” in diameter, a true “Champion” Tree. Redbud does well in most soils, but not in very wet, poorly drained soil. It likes full sun or light shade. This tree, used as an ornamental specimen, is best planted young as it does not transplant well. Diseases do not seem to be a great problem for this beautiful tree, although Canker and Verticillium Wilt do occur. Some caterpillars enjoy the leaves as do Japanese beetles, borers and web-worms. Regular watering, pruning out dead branches, and fertilization help keep Eastern Redbud healthy. Another name frequently used for Eastern Redbud is “Spicewood Tree”, because in the southeastern mountains of Appalachia the twigs were once used as seasoning for wild game such as venison. In the past, the bark of the Redbud was used as an astringent in the treatment of dysentery. The flowers can be eaten in salads, or fried. Cardinals, rose-breasted grosbeaks and pheasants, deer and squirrels enjoy the seeds.